The pronator teres is a small muscle located at your forearm and can induce wrist pain if it gets too tight or develops trigger points. Here on this page I will tell you all the info you need to work on this muscle and to eventually free it from excessive tension and trigger points, respectively. You will learn about this muscles’ pain zones, insertions, functions, overload movements, impaired movements, palpation and last but not least about how to massage it. If you overload your pronator teres, it develops excessive tension and will be eventually afflicted with trigger points. Then it might create pain in the ulnar region of your wrist and your whole volar forearm. The red in the picture shows you how common it is to experience pain in the respective area. The deeper the red, the more common the pain is if trigger points or too much muscle tension are present. With an abnormal tension and/or trigger points in the pronator teres, you might have pain and difficulties supinating your cupped hand in order to receive for example the change at a counter. This supination motion is the opposite of this muscles’ function. Hence it gets elongated/stretched if a supination is performed. This stretch can be very painful as it creates mechanical stress that is too much for the anyway tight muscle. This muscle possesses two muscles heads. The humeral head originates from the medial epicondyle of the humerus and the ulnar head from the coronoid process of the ulna. Together they insert at the mid of the radius. The X in the picture below is a common area for trigger point development. The ulnar origin and the radial attachment point are not visible in the muscle picture. This muscle supports the pronation of your forearm – palms down position – and thus helps its main pronator, the pronator quadratus. It’s especially active if the pronation-motion is fast or if there is external resistance added – e.g. using a screw driver –. 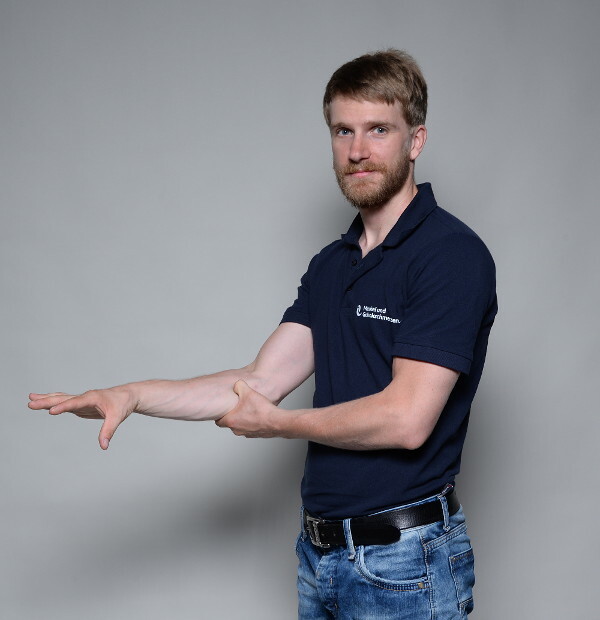 Beside the pronation, it supports the flexion of your elbow if external resistance – e.g. carrying box of water – is present. By now, you probably know some things about this muscle you didn’t know before. But what creates too much muscle tension and trigger points in your pronator teres? As the headline suggests, it is too much load on the muscle. Too much load can be caused voluntarily by repetitive use of the muscle or involuntarily by external forces. An example for voluntary overuse: Loosening up screws with your right or tightening them up with your left hand is a common scenario that causes problems. Especially if it is your daily business or if you are not used to this. Involuntary overload is mostly caused by a fracture at your elbow or wrist. The pronator teres is affected as it connects your ulna and radius, the two bones of your forearm. The displacement and the created mechanical forces during the accident display the overload. First of all, the muscles surrounding the affected/broken areas tighten up in order to stabilize the damaged structure and create a protective muscle tone. Secondly, the massive stress that made the bone(s) break, also might create trigger points. Self-massage can eliminate those points and lower excessive muscle tension. It also helps to prevent these conditions, once they are gone. The easiest way to palpate it, is by feeling it during contraction. Just place one or two fingers slightly above your medial epicondyle and start to pronate your forearm. Every time your palm is facing downwards, you should be able to feel a little muscle contracting. This is your pronator teres. Well done so far! Now it’s time to proceed with your massage. Forearm in the supinated position. Muscle is not contracted. Forearm in the pronated position. Muscle is contracted. I recommend using the thumb technique or the press and move technique. The first one is brilliant in order to get rid of trigger points, while the latter is great for relieving muscle tension in general. With the thumb technique, just palpate the muscle and search for tender spots. If you find one, massage over it for 10 – 15 times. Don’t rub around! Push in the muscle and only pull over the tender area. The press and move massage implies that you press on the muscle and then move it. Hence, pronate your forearm – palms down position –, place two or three fingers on the muscle and then slowly supinate and pronate your forearm for about 10 – 15 times.